The following extracts have been contributed by the author, Roy Hamilton, with the permission of the publishers, The Blackstaff Press. The views expressed in this chapter do not necessarily reflect the views of the members of the CAIN Project. The CAIN Project would welcome other material which meets our guidelines for contributions. This publication is copyright Roy Hamilton (1999) and is included on the CAIN site by permission of Blackstaff Press and the authors. You may not edit, adapt, or redistribute changed versions of this for other than your personal use without express written permission. Redistribution for commercial purposes is not permitted. Set against the dramatic backdrop of the Inishowen mountains, Derry has one of the most beautiful and panoramic locations of any Irish city, with its steep streets rising high above the River Foyle. Dating from a small monastic settlement in the sixth century, its strategic position meant that by Elizabethan times it was a fortress city, making it witness to some of the most bitter conflicts in Irish history, right down to the very recent past. 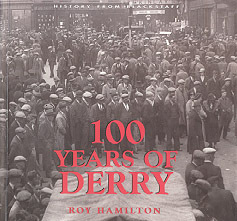 All of this has given Derry and its people a unique, robust identity, an identity that is vividly captured here in over 200 black and white photographs of the city in the twentieth century. Accompanied by lively, informative captions and text, and arranged by decade, the photographs depict emigrant ships leaving for America, hiring fairs, the First World War, the depression, the Second World War (when Derry welcomed American troops and saw the surrender of u-boats), visiting showbands, civil rights agitation and the outbreak of the Troubles, Bloody Sunday, Clinton’s visit and the recent regeneration of a city now poised self-confidently on the threshold of the new millennium. army checkpoints set up in the city during the 1970s. Shipquay Gate, where the army had established a checkpoint. Brooke Park. When James Hood Brooke died in 1865 his will stated that he wanted the residue of his estate to secure an area of land to be used for recreation by the citizens of Derry. The money was placed in a trust fund and when his sister Margaret died in 1884 she also left the residue of her estate to the trustees. There was now a sum of over £10,000, which was used to buy land and design the park, and it opened in 1901. The Gasworks, in the late 1070s, just before its closure. The gasworks opened in 1829 in Foyle Street and moved to this site in 1865. The Foyle Bridge nearing completion and the central span has still to be installed. Looking across Craigavon Bridge from the Waterside, the tower and spires of St Columb's, St Eugene's, Austin's and Carlisle Road Methodist Church dominate the skyline. St Eugene’s Cathedral from Westland Avenue, under major renovations. In the 1990s the Apprentice Boys of Derry organised pageants and re-enactments to commemorate the Siege of Derry and to help achieve a greater understanding of the background to the siege. In this late-twentieth-century version, the Williamite forces came from Sligo, and the Jacobite ranks were played by Derry men and women. 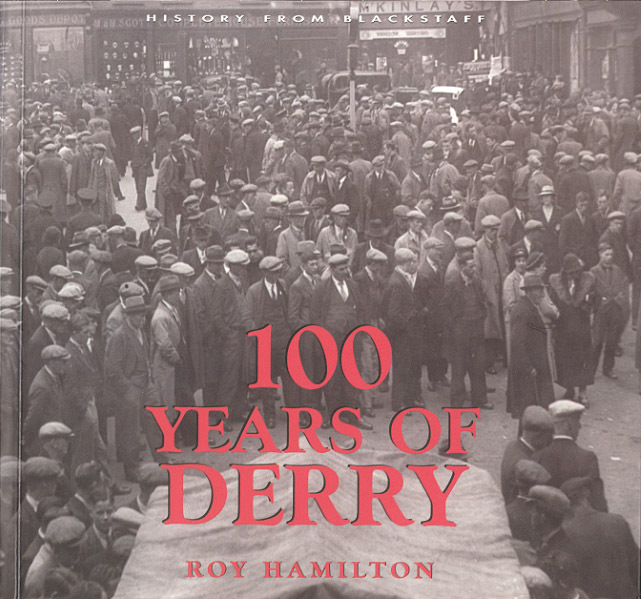 ROY HAMILTON was born in Derry in 1943. After leaving Foyle College, he worked with Du Pont de Nemours (UK) Limited for thirty-seven years before retiring. He is chairman of the Federation for Ulster Local Studies and president of the North-West Archaeological and Historical Society. He is also Assistant County Commissioner for Scouts for the Londonderry District. He is currently a freelance broadcaster and local historian.